Welcome back to the next adventure. For all of you who think I have just been hanging out since May, well, you are mostly right! Hanging out in the Puget Sound this summer was awesome! Between the perfect days and the beautiful surroundings, I was having too much fun to blog. 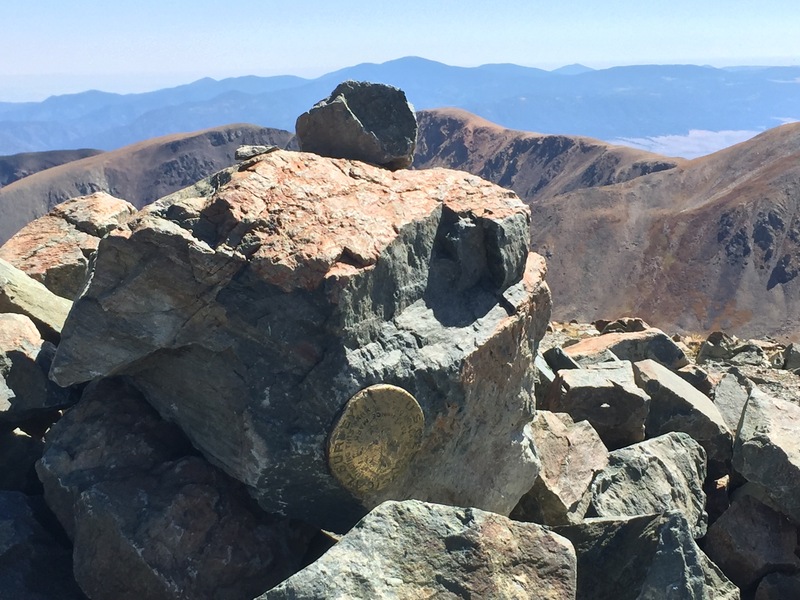 But, I am steadfast on getting my High point adventures posted and now I have one more to add to the pile: Wheeler Peak in New Mexico. Kerry, as always, spearheaded efforts to get more high points into 2015. The first was Boundary Peak in Nevada, a hike I missed. The second was Wheeler Peak. The plan was simple and straight forward – fly to Albuquerque on Friday and drive to Taos. 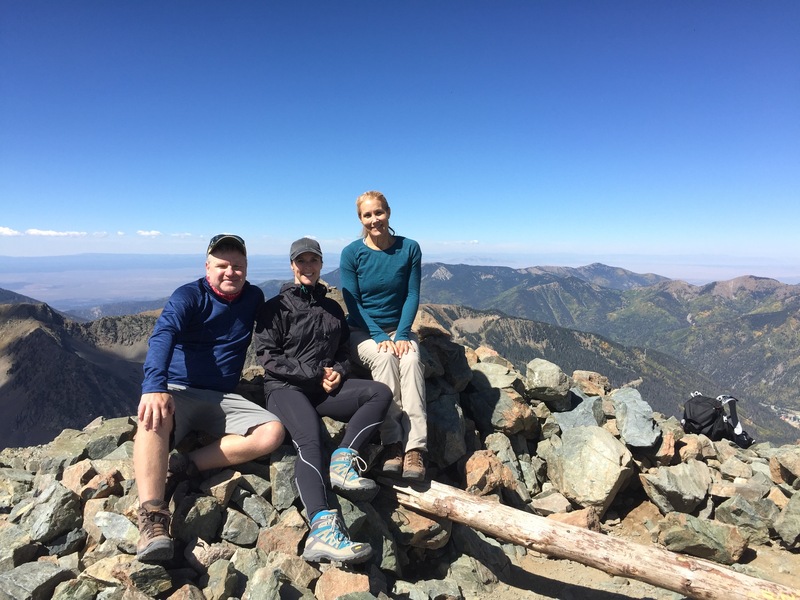 Hike the peak on Saturday, and then explore Taos. We planned a leisurely drive back to Albuquerque on Monday, with maybe a stop to see Santa Fe. No frills. Our posse for this trip was myself, Kerry and Jason. We arrived in Albuquerque at 7 pm and stopped at Sprouts to pick up a little road dinner, munchies, water and a celebratory beer (a definite must on any high point hike). We don’t have a beer at every highpoint, just the big hikes. It’s hard to celebrate after high points like Florida’s Britton Hill, which was basically a marker in a park 20 ft from the parking lot. But Wheeler Peak is a pretty strenuous hike, so we wanted to be prepared. Then we hit the road. Saturday started with a fueling stop (breakfast) at Michaels Kitchen in Taos. What a find! A good solid breakfast, reasonably priced, and nice wait staff. The place was full, and when we saw the bakery shelves, we knew why – cinnamon rolls the size of your plate, cream puffs as big as cantaloupes, and all kinds of pastries and doughnuts. On the drive up to Ski Valley, you pass through the small town of Arroyo Seco. A town none of us knew existed…we didn’t do a lot of internet research on this trip and failed to notice we could have stayed a little closer to the trail head. In fact, if you are thinking about this hike, you could even look into renting one of the many condo’s right in the Ski Valley complex. 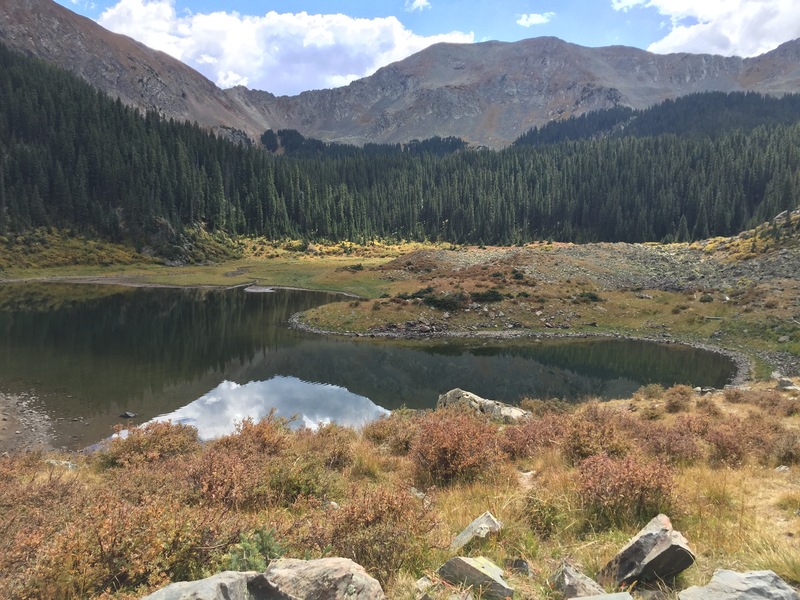 There are two routes up to Wheeler: The bull-of-the-woods trail at 14 miles round trip and the Williams Lake trail at around 9 miles round trip. The difference between the two, besides distance, is that the Bull-of-the-woods trail is a gradual ascent through more forest, while the Williams Lake trail has a very steep ascent in skree and is a workout. We knew that our late morning arrival forced us to take the shorter route, as we wanted to be off the mountain by early afternoon to miss any late day storms. Fortunately for us, the weather was perfect and clear. There is a lot of construction going on at Ski Valley, and we had heard that the trail head parking is a bit difficult to find. The trick was to follow the signs to the Bavarian Restaurant. After only 2 wrong turns we found the hikers parking lot – 2 wrong turns on steep bumpy dirt roads that the rental car company would not have approved of… The parking lot is further from the trail head than the parking for the Bavarian Restaurant (park there!). You start the hike up a road, pass the restaurant and scoot by a chair lift and another “ski-in” grill (The Phoenix) before you spot the trail head sign. Immediately on seeing this, you will hear a stream rushing over rocks, and you enter into the forest. It is a very leisurely hike for the first 2 miles in the forest. At that point there is a detour if you want to go on to Williams Lake (0.5 miles) which we did on the way back down. After another half mile, while still in the trees, you start a noticeable climb, which steepens when you emerge from the tree line and start a switchback route up the bare side of the mountain and over skree patches. The view along the route is outstanding, but the trail itself is barren. Unless you are in top notch shape, your heart rate is up, your out of breath at times, and your legs are working! The chipmunks and marmots add to your hiking entertainment, so use them as an excuse to stop and rest! And drink water! you are over 10,000 ft at this point and you need more water than you realize! At the top you get fantastic 360 degree views, and the company of all those hikers that passed you on the way up. And bees… first summit I have ever been on where bees are active. You will also meet friendly fat chipmunks that will get into your pack if left unattended. We settled in for a bit of lunch, a celebratory toast, and pictures. 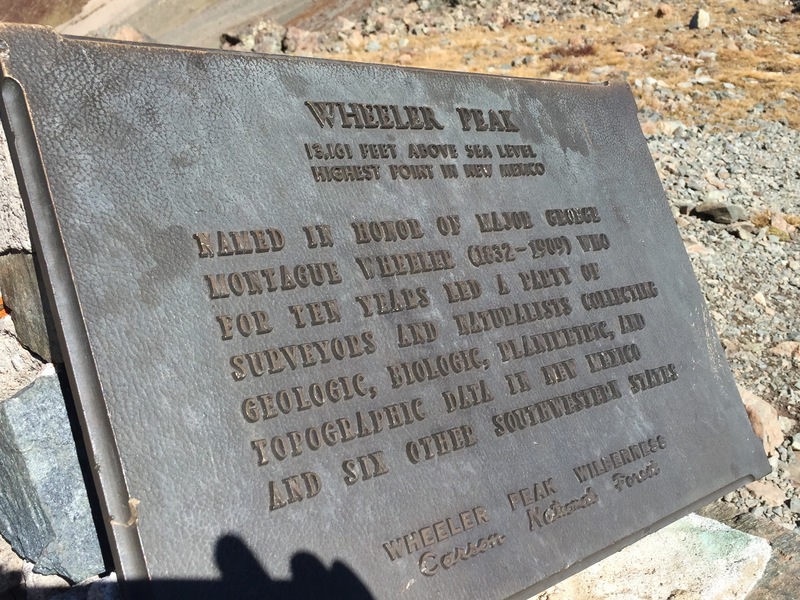 There is a plaque on the summit, a marker and a sign in log. After 45 minutes on the top, we headed back down to the Bavarian. The trip down is a killer for old knees, but it is a quick route. We popped in to see Lake Williams and then headed for a beer at the Bavarian! On the way down, we did stop to see a couple of places in Arroyo Seco, and then cleaned up for a beer and a ballgame at the Taos Brewery. Perfect Day.